This die is a reverse-cut design, meaning it will cut ONLY the little hearts from your paper. Measuring 3.75" x 5", it makes a quick open background. Save all the little falling hearts for shaker cards, or use as confetti to brighten someone's day. 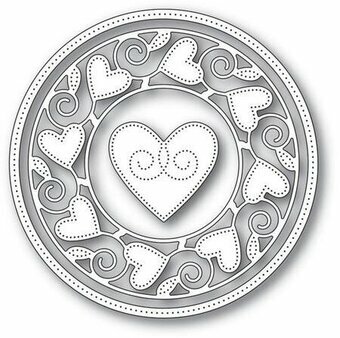 Share symbols of love and affection on all of your paper crafting projects with the Eyelet Hearts Die. Choose from a wide assortment of nesting hearts in varying sizes allowing for perfect layering, as well as mixing and matching of decorative eyelet edged hearts with plain edged heart shapes providing unique embellishment combinations. Ideal for adding sentiments to card fronts or for use as lovely accents on scrapbook layouts. With the Eyelet Hearts Die you will always have the perfectly sized heart on hand. These dies are part of the Heartfelt Love Collection.prox. 1. Eyelet Heart 1: 1.5"x 1.5", 2. Eyelet Heart 2: 2.0" x 2.0", 3. Eyelet Heart 3: 2.75" x 2.75", 4. Eyelet Heart 4: 3.25" x 3.25", 5. Eyelet Heart 5: 4.0" x 4.0", 6. Heart 1: 1.25" x 1.25", 7. Heart 2: 1.75" x 1.75", 8. 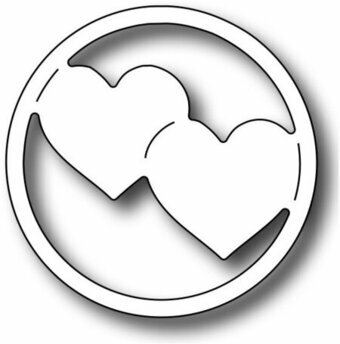 Heart 3: 2.5" x 2.5", 9. Heart 4: 3.0" x 3.0", 10. Small Border Die: 4.0" x .5". Cruise back in time with nifty die cuts of high wheeled bicycles, old coupes and classic airplanes! Adding a retro style embellishment to any masculine themed paper crafting project becomes quick and easy! Create interest on card fronts or scrapbook layouts by displaying sentiments on either of the decorative banners creatively designed to be used in conjunction with any of the classic modes of transportation within the collection! 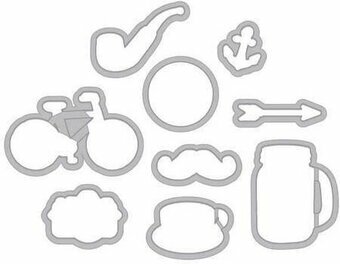 Warning: use of these die cuts may bring about feelings of youthfulness and fond memories! 1. Classic Airplane: 4.0" x 2.5", 2. Classic Coupe: 4.0" x 2.0", 3. High Wheeled Bicycle: 3.25" x 3.5", 4. Best Wishes Flag: 2.75" x 1.5", 5. Congratulations Banner: 3.0" x 0.75", 6. Prop Accent: 1.5" x 0.25". These Hipster at Heart Frame Cuts are wafer-thin metal dies that pair perfectly with Hero Arts stamp designs. Made in the USA, these universally compatible dies are easy to align around your stamped images. Coordinate with Hero Arts Hipster at Heart Clear Design Stamps. This funky pair of dies will add a touch of steampunk or grunge to any project. . These pop-up hearts make a fantastic addition to your 3D projects. Use them on their own, or combine them with other 3D dies such as the Pop-Up Love die. Includes 1 die. Size: 2.75 x 2.5 inches. Kaisercraft die featuring a Decorative Heart. These steel dies will cut through cardstock, thin chipboard, felt, acetate, sticky back canvas, sandpaper, foam and much more! They work with virtually any die-cutting machine that will accommodate wafer-thin dies and are sure to become an essential ingredient in your paper crafting process. Kaisercraft die featuring a star, an arrow, a diamond, a heart, and more. These steel dies will cut through cardstock, thin chipboard, felt, acetate, sticky back canvas, sandpaper, foam and much more! They work with virtually any die-cutting machine that will accommodate wafer-thin dies and are sure to become an essential ingredient in your paper crafting process. Our large love themed lattice heart cuts a delicate open design perfect for many looks. One idea is to weave ribbons through the lattice to create a beautiful texture. Approximate size is 3.75" x 3.2". Hearts and Swirls (3 metal dies) - Largest Metal Die Size 4.7" x 5.3". Compatible with most leading brand die cutting and embossing machines. Personally designed by Leonie Pujol, this beautiful collection is perfect for all your crafting creations. Interlocking Love (3 metal dies) - Largest Metal Die Size 4.9" x 4.9". Compatible with most leading brand die cutting and embossing machines. Personally designed by Leonie Pujol, this beautiful collection is perfect for all your crafting creations. Love themed Penny Black Creative Die featuring a line of hearts. You can't go wrong adding this mixed collection of hearts to your stash. The whimsical shape and assortment of sizes makes these symbols of love an essential supplement - when you need just one little touch to make your card complete, Lots of Hearts may be your answer! The Lots of Hearts Die-namics includes hearts ranging from approximately 3/4" x 5/8" to 1 1/4" x 1" in size. MFT Die-namics, our very own exclusive American-made line of steel dies. Used alone, layered over the coordinating die cuts from Lots of Hearts, or mixed and matched to create a unique collage, the Lots of Hearts Outlines are a beautiful supplementary collection of icons for your stash. The Lots of Hearts Outlines Die-namics includes hearts ranging from approximately 7/8" x 3/4" to 1 3/8" x 1 1/8" in size. MFT Die-namics, our very own exclusive American-made line of steel dies. Love themed Penny Black Creative Die featuring a border of hearts. Christmas themed craft die Sara Davies featuring a heart with a pair of birds. Die size is approximately 3.6" x 3.1" (90mm x 78mm). Love themed Penny Black Craft Die featuring a heart and musical notes. Xcut-Mini Decorative Dies. These dies are super-efficient and can cut through cardstock and foam! Compatible with most die-cutting machines. This package contains Love You Heart: one 2x2 inch die. Imported. Valentine themed craft die from Memory Box featuring stitched hearts. Memory Box craft die featuring Double Stitched Hearts. 1.5 x 1.5, 1.5 x 1.3, 1.2 x 1.2, 0.9 x 1, 0.9 x 0.8 inch. Memory Box stencil featuring hearts. 4 x 5.4 inches. 10.2 x 13.8 centimeters. Hero Arts Paper Layering dies offer unique styles and designs around a new concept in paper crafting. Paper Layering allows you to cut normally, giving a pop-up style of cut, and then, after folding or curling the cut edges, the image reveals itself, giving a 3-D dimensional look to your paper. Hero Arts metal dies are made with precision cutting edges and sturdy construction, and are universally compatible with most die-cutting machines. Valentine themed Memory Box craft die featuring a heart surrounded by a circular heart frame. Craft die from Poppystamps featuring a border with hearts. 0.6 x 5.5 inches. Poppystamps craft die featuring a tag with a heart. Memory Box/Poppy Stamps craft dies are made of 100% steel. For use on cardstock, felt, and fabric. Cut, stencil, emboss, create! Use in most leading die cut systems. Love themed craft die featuring hearts. 5 dies included. Poppystamps craft die featuring a Ribbon Heart. Memory Box/Poppy Stamps craft dies are made of 100% steel. For use on cardstock, felt, and fabric. Cut, stencil, emboss, create! Use in most leading die cut systems. Poppystamps craft die featuring a shooting star heart. Memory Box/Poppy Stamps craft dies are made of 100% steel. For use on cardstock, felt, and fabric. Cut, stencil, emboss, create! Use in most leading die cut systems. Poppystamps craft die featuring a border of hearts. Memory Box/Poppy Stamps craft dies are made of 100% steel. For use on cardstock, felt, and fabric. Cut, stencil, emboss, create! Use in most leading die cut systems. Poppystamps craft die featuring Twirling Hearts. Memory Box/Poppy Stamps craft dies are made of 100% steel. For use on cardstock, felt, and fabric. Cut, stencil, emboss, create! Use in most leading die cut systems. This beautiful Ruffled Heart frame die looks like real gathered lace, so soft and romantic. The heart measures 3.5" x 3.125". 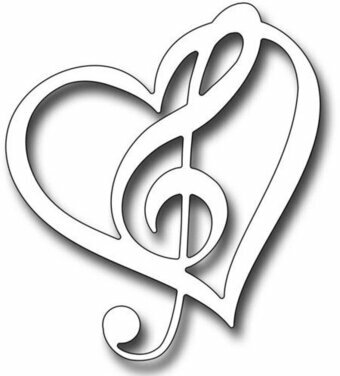 We have also nested the words "True Love" as an added bonus! The Scribbled Heart Wreath is another very versatile die design. Included are a scribbly heart measuring 3.1" x 3.125", which is great to use as a frame for stamped sentiments. Also included is a center die containing plenty of tiny flowers and tiny leaves to adorn the scribbled heart and turn it into a grapevine wreath. You'll find so many uses for the tiny flowers, which range in size from 0.2" to 0.5". Cheery Lynn Designs die. Try coloring the tiny hearts before rolling the strip with your quilling tool or crafting tweezers. Then peel back the fringe to create a beautiful flower with tiny hearts scattered among the fluffy petals. Diamond Lace Frame Cut and Emboss Folder is an embossing folder with etched dies embedded inside to cut and emboss in one pass. Everything is done for you! Fits an A2-sized (4.25 x 5.5 in.) card front. The sandwich to use with the Spellbinders Platinum Die Cutting Machine from bottom to top is: Platform Plate, Cut and Emboss Folder with cardstock inside and one Cutting Plate. Approximate size: 4.25 x 5.875 in. Shapeabilities Double Heart Gift Box Etched Dies Timeless Heart Collection by Marisa Job is a set of eight dies that assembled into a tall box. You can make the box design from plain to ornate - the choice is yours. Assembled Size: 4.25 x 2.125 x 2.125 in. Licensed Designer Marisa Job brings sweet floral and heart motifs together to create this Timeless Heart Collection to help add beautiful elements into projects. Spellbinders Shapeabilities cut, deboss, emboss and stencil with a single etched die template. Shapeabilities From Heart and Hand Sew Sweet Collection by Tammy Tutterow is a set of six dies including a scalloped edge tag with accent designs to complement. Inspired by Tammy's love of sewing, stitchery and all things handmade, her Sew Sweet Collection takes your projects from paper to fabrics and beyond, expanding possibilities in creating heartfelt projects. Approximate Size: Tag: 2.00 x 3.25 in. 5.10 x 8.30 cm, Flower: 0.53 x 0.54 in. 1.40 x 1.40 cm, Circle: 0.50 x 0.50 in. 1.30 x 1.30 cm, Flag: 0.50 x 0.65 in. 1.30 x 1.70 cm, Heart: 0.78 x 1.20 in. 2.00 x 3.10 cm, Hand: 1.89 x 2.46 in. 4.80 x 6.30 cm. Shapeabilities Heart Flower Box Etched Dies is a set of eight dies to create a lovely box including all the designs needed to decorate the box for a beautiful presentation. Blooming Garden Collection by Marisa Job brings sweet floral designs in many forms from accents to boxes to frames. Perfect for special occasions such as weddings, showers or as a lovely gift. Assembled Size: 4" x 3.5" x 1". Shapeabilities Heart like a Wildflower Etched Dies Good Vibes Only Collection by Stephanie Low is a set of four dies which includes two wildflower silhouette shapes and its two coordinating intricate floral designs. An admirer of all things nature and organic in shapes and elements, Stephanie Low was inspired to create Good Vibes Only Collection. It also complements her Cool Vibes Collection to bring your projects to the next level. Approximate Size: Wildflower: 1.50 x 3.25 in. 3.80 x 8.30 cm, Backer: 1.70 x 3.45 in. 4.30 x 8.80 cm, Vine: 0.95 x 3.00 in. 2.40 x 7.60 cm, Backer: 1.10 x 3.10 in. 2.80 x 7.90 cm.